It’s time to go all out and celebrate the beauty of fresh growth this Christmas. 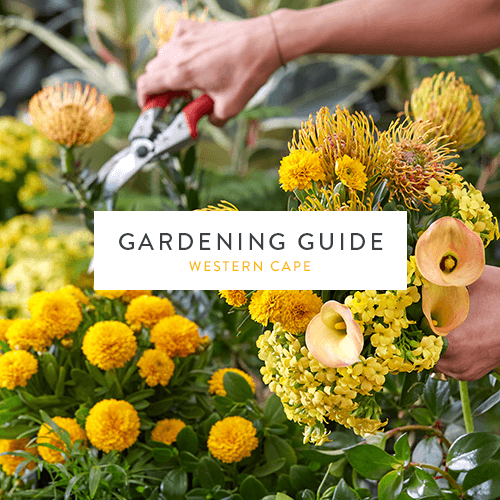 We cover all the gardening tips you need this month, guide you in choosing festive plants for the season, and give you a holiday checklist to ensure your summer garden stays alive while you’re away. What’s a Christmas table without the festive cheer of poinsettia? If you take proper care of your poinsettia, it will last well beyond the festive season and into the new year (and might even bloom another season!). Read our tips on how to select and take care of your poinsettia this summer. Plant heat-tolerant bedding plants like amaranthus, gomphrena, verbena, zinnia, vinca, marigolds, gazanias and dianthus. Plant sun-loving herbs such as rosemary, origanum, sage, thyme and fennel. Bulk up your summer veggie garden by sowing seeds such as beans, broccoli, Brussels sprouts, cabbages, cauliflower, cucumber and celery. Feed your summer garden with a general fertiliser like 2:3:2 or an organic all-purpose fertiliser and water deeply (do this with grey water using a watering can in the mornings and evenings). Check the mulch around your roses and reapply if necessary. Nourish them with 8:1:5 or 5:1:5. Feed cannas, daylilies, hibiscus and dahlias with 3:1:5. Feed hydrangeas with Nitrosol or Multifeed once every two weeks. If the leaves start to turn yellow, treat plants with iron chelate or Epsom salts. Sustain indoor and outdoor container plants with an all-purpose liquid fertiliser like Multifeed or Seagro. Deadhead annuals and perennials like lavender, daisy bushes, geraniums, candytuft, catmint, veronica and phlox. Cut back wisteria to encourage productive flowering next year. Clip your hedges neatly, making sure that the base is slightly broader than the top, so that sunlight can reach all parts of the plant. Pull up any weeds before they go to seed and cause more problems for next year. Weeds steal valuable water and nutrients from your plants. Weed your flower beds and mulch the soil well. Deadhead flowering shrubs so you’ve got more chance of a beautiful flush of blooms on your return. Move potted plants to a shady area to prevent them from drying out too quickly. Store all your garden tools and outdoor furniture in a secure spot. Pro tip: If your potted houseplants dry out too quickly after watering, try this simple trick: When repotting, tuck a damp sponge into the bottom of the pot before filling with soil. It will act as a water reservoir and you’ll need to water less often!